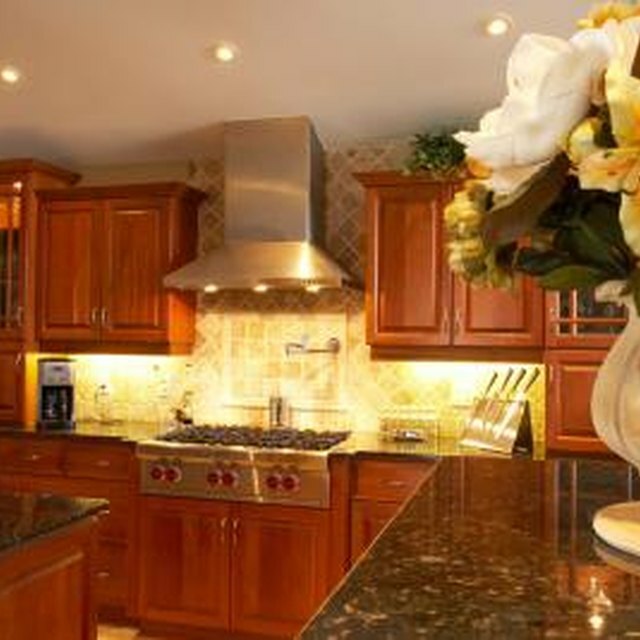 There are a number of different approaches that may be taken to remove color stain from kitchen cabinets. Sanding is not a method recommended, as you may scratch or alter the original design. Stripping the cabinets using chemicals is most effective, although this method must be approached with care as the chemical can be toxic to the skin and the fumes hazardous. However, with the proper preparation and safety measures, removing color stain from cabinets can be done without great difficulty. Remove colored wood stain from kitchen cabinets. Prepare yourself with protective clothing, safety glasses and gloves. Brush the liquid solvent remover onto a small area of the wood. Work the stripper into the color stain using steel wool. Choose a steel wool grade appropriate to the type of wood used in the cabinets, 00 on hardwoods and 000 on softwoods. Wipe the liquid solvent from the wood with a rag before it is allowed to dry. Continue to repeat the first three steps, working on small areas, until the color stain is completely removed from the cabinets. Once the color stain is gone, wipe down the cabinets with denatured alcohol to remove all residue. If you choose to remove the color stain using a commercial paint or varnish remover, follow the instructions on the side of the container. Make sure that you are working in a well-ventilated area and are wearing protective clothing, gloves and safety goggles. Take breaks in the fresh air to avoid long exposure to the chemical fumes.